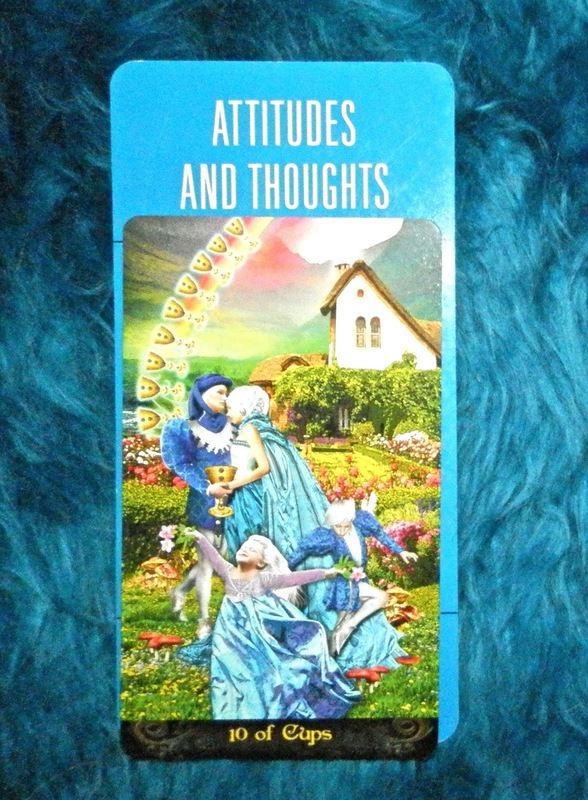 Today's Draw: Ten of Cups from Tarot Illuminati in the Attitudes and Thoughts position from the Deck of 1000 Spreads. Where do you fit in at this stage of your life where happiness is concerned? When you look at the picture on this card, do you think "what's their secret?" Or do you think, "hey, they look just like me?" Hooray! Today you get one of the happiest. Cards. Ever. And you know why everyone on this card is so happy? As you'll notice, they have no fence to look over, so they can't compare their life to the lives of others. And they have no satellite dish on their house beaming messages from the advertisers and media about what they should have, what they should look like and who they should be. Instead, they just know they love each other. They know they're surrounded by beauty. They know their humble home is enough. They're warm and fed and clean. What's more to want? Chances are you have all those same things. Are you as happy? 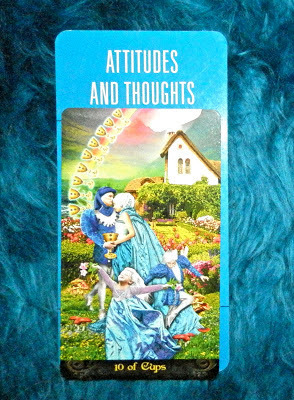 Our attitudes and thoughts alone can change our entire world. My own life changed drastically when I stopped seeing myself as single and alone and started seeing myself as the matriarch of a family that included three dogs. My sense of how much love I had in my life changed when I gave myself permission to count dog love and self love as part of my love bucket. In fact, most of the time I feel far more fortunate than the standard nuclear family because, let's face it, nobody loves you like a dog loves you. They're never mad at you. Their entire worlds stop when they catch sight of you. See what I'm getting at? Nothing changed outside of me to change the way I felt about my life. What changed was *inside* of me. The difference between happy and trying to be happy is all on where you place your attention. Are you focusing on what you need to make yourself happy? Or are you focusing on what you have that makes you happy? If you tend toward the former, you will never be happy. Because your happiness is dependent on some set of circumstances you'll never attain. Because the minute you catch up to one circumstance, another goal comes in sight. All you train your vision on is lack, so lack is all you see. If you focus on what you already have that makes you happy, then everything you see is something that brings you joy. And when you show gratitude for those things, more of that stuff enters your life. It really is as simple as "what you focus on grows in your life". Focus on lack and the lack gets bigger. Focus on fulfillment and the fulfillment gets bigger. It's hard not to compare yourself to others or to some ideal that doesn't. Our society makes it hard. And people wear masks to appear happy when they're really not. So it seems like others have some secret we don't...they married smarter, work smarter, have better kids...whatever. But here's their secret—either they're not really happy, or they focus on what they have and not what they lack. It's the only secret you need to know. And it's as easy to attain as it is to stop biting your fingernails or break any other habit you may have. The only thing that stands between you and the Ten of Cups is...you.